Similarly, Rumours’ unfussy mish-mash of urban and indie styling gives them the look of three people pulled together from different bands – a nod to their sonic individualism and an antidote to today’s landscape of commercialised pop and cookie-cutter groups. But despite their musical and sartorial differences, everything falls into place in the studio and on stage, with deep-dive electronic grooves and ethereal vocals intermingling on 2016 EP ‘Shapes’ and this year’s summer release ‘Hunter’, a dreamy love letter to escapism. 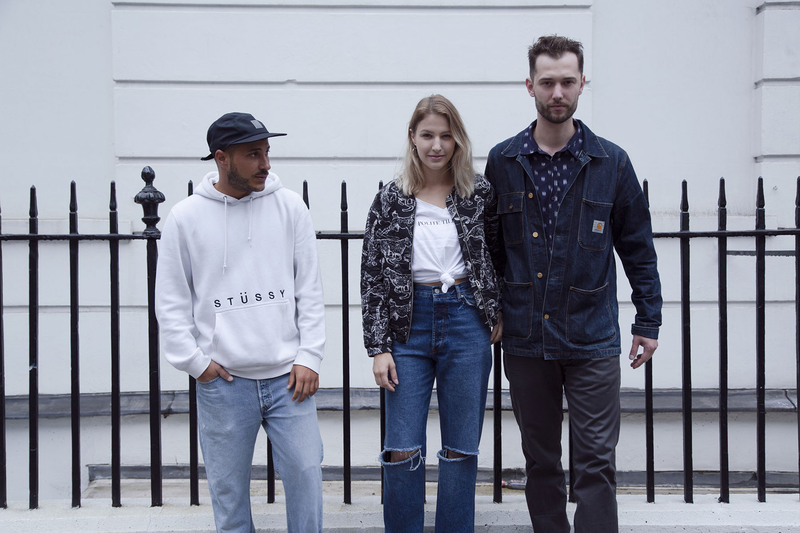 With their upcoming EP due out in February and a new club night, Bound, launching on December 8th at Shoreditch Platform, Rumours are navigating a busy schedule while simultaneously – in Marion’s words – “learning what it means to be an independent act and how to self-release music”. Ahead of their gig supporting Anchorsong and his string quartet at Dalston’s Birthdays, we caught up with the band to talk early influences, relocating to London, and the highs and lows of releasing music as unsigned artists. You’ve known each other since your teens, tell us about how you met and your very first impressions of each other? Mark: I met Fede during the first year of high school, we were both quite the troublemakers back then. So, at first, we bonded over driving our teachers mad and getting in all kinds of absurd situations. Luckily, our focus and priorities eventually changed to making and performing music. Fede and Marion met at a party in university around 2014, and when I met her I thought she was a very radiant and welcoming person, she loves to chat with people, which is good because Fede and I are not so talkative, so she brings some balance. How has your sound evolved since those early days of writing together? Fede: Our sound has evolved massively since we started the project. We’ve been experimenting a lot with our songs and it’s been an interesting process. We all have such different musical backgrounds and tastes, which has made a big impact on our sound – sometimes a bit too much, as a lot of our tracks are quite different, and at times it’s been hard to fit them into a defined music genre. After a couple of years of working together, we now have a more clear idea of what the Rumours sound is. Since we started writing our latest EP it’s all really coming together. Where can we catch you playing live this month? Fede: We will be spending most of our time writing for our new EP, but we are super happy to be playing at Birthdays in Dalston on the 16th of November, supporting Anchorsong and his string quartet. Your upcoming EP launches in February, what inspired it and how does it build on last summer’s EP ‘Shapes’? Marion: I think that we’re still at a point where what inspires us to write and release music is about wanting to share our ideas, for people to get to know our project and for us to see how they will react to our music. So it’s more like a general and ongoing state of mind instead of something like “Oh yes, I wanna write an EP about that”. Fede: The direction we are taking with this release is definitely to stay true to what we really like, trying to make music we would like to listen to ourselves and not what we think people want to hear. Since the release of “Shapes” we have learnt a lot and have been able to be more honest with each other about what we want. How would you describe your individual roles in the band and the overall dynamic? Mark: We have different talents or skills and we try to make the most of them, I spend most of the time songwriting, Fede producing, and Marion works with us either from the start, or later on in the process, performing and adding her own touch to the ideas we come up with. Fede: Playing Dimensions Festival this summer, despite the weather being on the moody side, is definitely on top of the list for me. Followed by Koko last year and Parkteatret in Oslo was a very nice experience too. Mark: Going to Oslo was a very special one for me as well, we met a lot of great people and the Scandinavian scene is very interesting. Releasing our first song, “I Do It All” was an important milestone, it opened a lot of doors for us and made us believe more in what we are doing. Marion: Agree with all of the above, just have to add the show we played at Village Underground – because I love that freaking venue! … and the biggest challenge? Marion: We’re all growing together and learning what it means to be an independent act and how to self-release music – the business and self-promotion side of being a band is one of the hardest things for us to deal with, but also very interesting. Who were the artists that you each grew up on? Fede: When I was little my father used to play music constantly in the house, I remember listening to a lot of classical music, jazz and a lot of David Byrne, alongside some Italian artists like Lucio Dalla and Almamagretta. Growing up I got into electronic music and hip hop/rap, I was obsessed with The Roots and still am. Mark: Same here, my father was a huge influence on me regarding the music I listened to growing up. He’s a musician himself and when I was very little I’d listen to him playing piano more than anything, but the artists I’ve been really into are Lauryn Hill, D’Angelo and other Neo Soul artists. On the other side my mother has introduced me to a lot of artists like Dire Straits, or Edie Brickel at bedtime, and I think that made me have an inclination towards writing lyrics. Marion: I’m a real 90s child, so I grew up listening to all kinds of pop music. I had a lot of road trips with my dad when I was younger, where we were listening to country, rock ‘n’ roll and rhythm and blues. I’ve been through all kinds of phases really. …and which current artists do you most admire? We last saw you at our self-styled shoot in Marylebone, how would you each describe your day-to-day style? Fede: I like nice clothes but never been much of a fashionista. I like streetwear, simple comfy clothes, sneakers and caps. I’d say my style is very casual. Mark: Streetwear is my thing too… I’m addicted to Carhartt. Me and Fede are probably their most loyal customers. Marion: I dress in whatever I feel like on any particular day. I’m definitely a jeans and t-shirt kind of girl, but no one would be surprised if I suddenly rocked up in something crazy, I do like to have fun with my style too. Your new club night, Bound, kicks off December 8th at Shoreditch Platform with Kay Sazuki – how did that come about and what’s in store? Fede: Bound was basically born this summer from a collective of close friends, which ranges from creatives in advertising to film makers, photographers, media curators and DJs. We all have a common passion for music. I was given the opportunity to organise an event at Shoreditch Platform and I wanted to get everyone involved and organise the event together. The first night back in September was really cool, we had a lot of fun so we think that it will be worth arranging more nights and see how it goes. We’re now planning a second night on the 8th with Kay, which should be great fun and one in February. Could there be potential for an ongoing Rumours club series? You’re from Norway and Italy respectively and now live in London, has that process of relocation influenced your sound at all?Mark: It definitely did. It might sound a bit cliché, but we all moved here for a reason, to be in one of the biggest musical melting pots of the world. For a lot of years we have experienced and lived in this city and its music scene, and it has become part of who we are now, which definitely influences our sound. Marion: We have all moved away from countries where the music scene is moving forward too, but is not necessarily as open and diverse as here in London. I think it has influenced us in a way where we are more fearless and dare to try different things. It’s been a crazy year in politics, would you describe yourselves as politically active? Mark: I don’t think any of us are really politically active, but I can say I was really happy to see the great support Jeremy Corbyn received in the last election. I hope in the future we see more of men like him, or Sadiq Khan who also seem to be more progressive and open-minded than others. Marion: Yeah there are a lot of crazy things going on in the world right now, I definitely like to discuss politics and stay updated with what is happening, but it can also feel overwhelming and unfair at times. Tell us one thing about yourselves that might surprise us? Mark: I can make some mean sushi?! Or, what else? I broke my left leg four times! Fede: All my family members are either dancers, choreographers or ballet teachers.